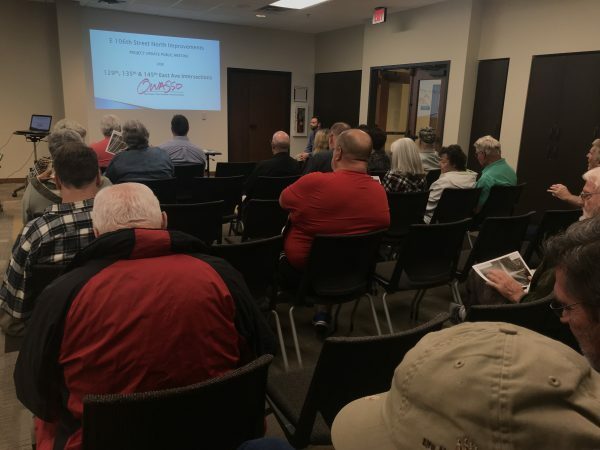 11/02/2018 – It was a full house Tuesday evening, as citizens turned out for an public meeting covering 106th Street North road improvements. In the link below, you will find the presentation presented at the public meeting . Also below, City Engineer Dwayne Henderson,compiled the questions/answers that came from those attending. A: We are using our opportunity to let the FHWA fund projects that qualify for their funding, leaving other funds available for other projects. A: 106th/145th was a part of an intersection study performed in 2005. The four worst intersections for traffic movement at that time were studied: 106th/Garnett (Highest Priority to lowerest), 106th/145, 96th/145th and 96th/Mingo. 106th/Garnett was completed several years ago using 80%/20% matching Federal funds. 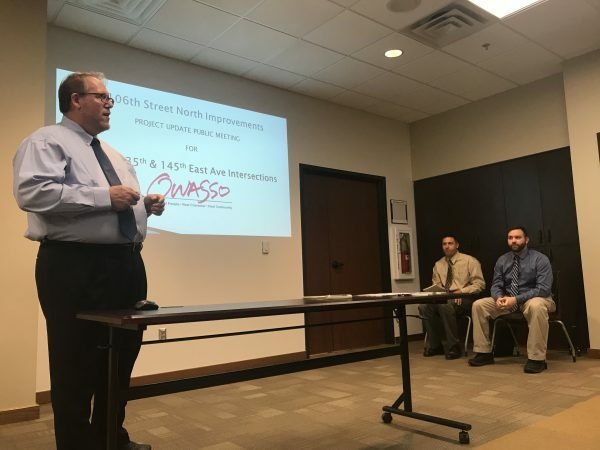 106th/Garnett was funded with recommendations through the Capital Improvement Committee and approval through the Owasso City Council for 100% City of Owasso funds. 96th/145th has been submitted to INCOG for the 80%/20% Federal funding twice but has failed to make the priority list for the INCOG area and the 96th/Mingo project has not had any activity. Q: Why isn’t the City of Owasso funding it with sales tax 100% instead of waiting five years for the Federal funds? A: Because the City of Owasso is using as many avenues as possible to help fund our projects. Many projects are funded through sales tax and we have a more needs than sales tax funds currently available to us. Q: What impacts do you see from this project to the property owners. A: City of Owasso will have to secure right-of-way and easements eventually. The process is regimented and lengthy. Could take up to a year like the 116th/129th intersection has to complete ROW. Q: What environmental concerns do you have for this project? A: If the yards around the project are kept mowed and grass low, the ABB should not be a concern. The long eared bat could be an issue if they have a habitat nearby, like they did on US Hwy 169 bridge replacement a few years ago. No others potential impacts that we can think of at this time. Q: Why asphalt construction and not concrete at the 137th East Ave Intersection? A: Because this intersection could get widened at a later date and asphalt is easier to remove. Q: How long will road be shut down for milling? A: Milling and Overlaying will occur within 24-48 hours of each other. Very short time frame. Q: When did ODOT limits of access change on 137th East Ave change? A: We are not aware that it had from the initial taking on US Hwy 169. Q: Will the 137th East Ave intersection be signalized? Q: Will the exit ramp be signalized? A: Not at this time. If it happens someday, ODOT will take the lead on it. Q: Why is Arvest Bank being allowed to construct on such a small lot? A: The road was required as a secondary access for fire protection. The 138th tie in was to keep another curb cut from occurring on 106th Street North. The road was not mentioned to the HOA probably because the decision to require it was made after the meeting. Q: Will the intersection have signals? A: Yes. Fully urbanized intersection like 106th/Garnett. Q: What is happening with the Robinson land? A: We heard about several options, but nothing has come to use in the form of plans. Q: What is the future of 145th East Ave? A: ODOT is handling a future signalization project at that intersection, which appears to be scheduled for 2022, according to the current 8-year plan. City Engineer Dwayne Henderson answers citizen questions at public meeting over 106th Street improvements.